As the fundamental overhead environment course, the Cavern course is not to be taken lightly. The Cavern course is a bit like learning how to drive a car : how to manage the steering wheel, the gears, the breaks…before getting on the road. Welcome to the ‘Twilight Zone’. Even though one could attend this course on single tank according to the standards, by experience and for safety reasons, I only train students who are proficient with their double configuration (Sidemount, Twinset). This course can be taken either as a stand-alone course or in conjunction with the Intro to Cave course. 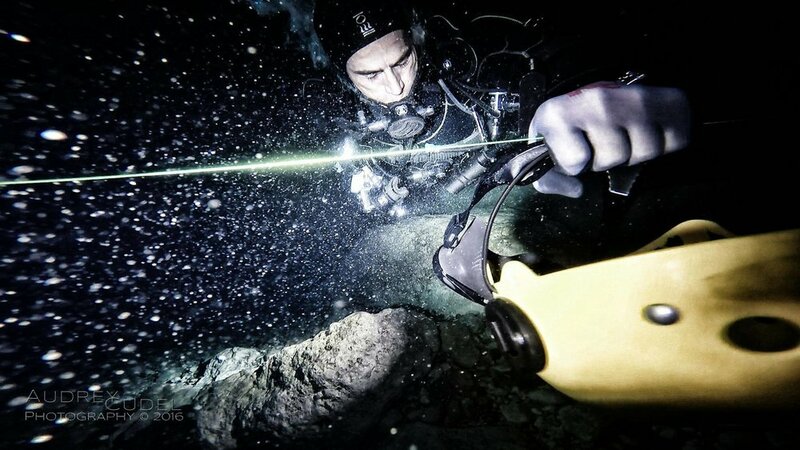 Land Workshops including all Cavern equipment configuration review and all in Cavern skills : each dive happens on land before heading to the water. Theory starting with an introduction to the types of caves, their formation, proper understanding of all Cavern standards and introducing you to line deployment strategies, team work, team placement, interaction with other teams, means of communication, marking, gas rules and gas matching, pre-dive planning, SAC rate calculations. In water skills introducing you to proper line deployment strategies as a team, tie-off techniques, refinement of finning techniques, team placement, methods of communication, out of visibility and/or out of gas exits, cavern referencing, cavern equipment failures. This program is your next step of your journey into of the darkness. You will have learned how to drive a car during your Cavern course, now the time has come to get on the road and become familiar with the traffic and all the road signals. 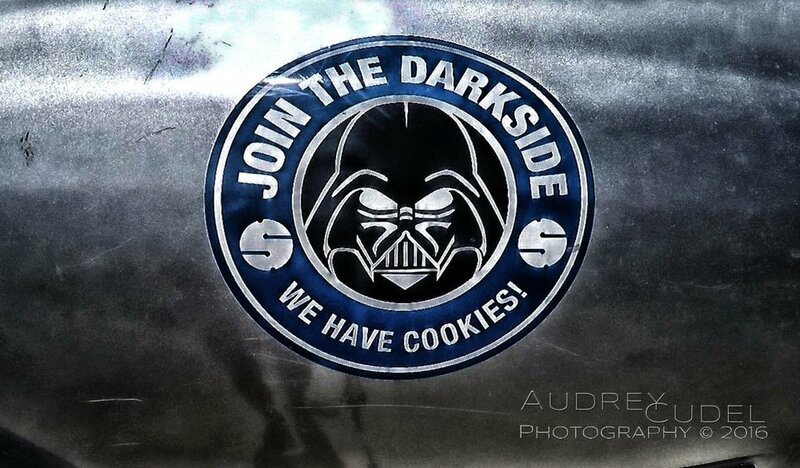 Welcome to the ‘Dark Side’. Once completing your Intro to Cave, it is definitely recommended that you have more practice at this level before rushing to the next one. 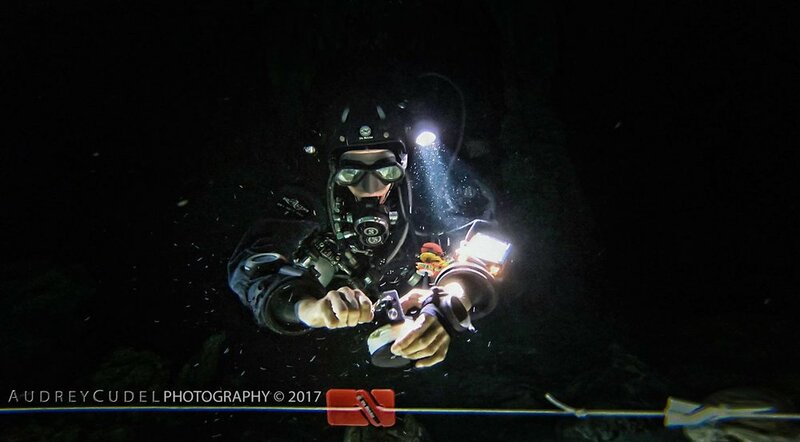 Land Workshops including cave specific equipment review and all Intro to Cave skills : each dive happens on land before heading to the water. Theory starting with proper understanding of all Intro to Cave standards and introducing you to connections to permanent lines options, team work, team placement, interaction with other teams, methods of communication, personalised marking, gas rules and gas matching, pre-dive planning, SAC rate calculations, simple vs. complex navigation, cave maps and circuits analysis. In water skills introducing you to permanent line connection procedures, refinement of finning techniques, team placement, means of communication, marking analysis, out of visibility and/or out of gas, cave referencing and circuit memorisation, cave equipment failures, lost line and lost diver procedures. This program is a milestone achievement for overhead environment training. It combines all the skills you have developed so far and adds more complexity to it….Welcome to the ‘Kessel Run’. At this stage, students should have mastered buoyancy, trim and be able to adapt all their finning techniques to the overhead environment. They should be proficient with their double configuration (Sidemount, Twinset). The Full Cave course does not intend to teach you how to make your way through major restrictions but how to make your way safely out of a cave when planning complex navigation or complex circuits. Land Workshops including cave specific equipment review and all Full Cave skills : each dive happens on land before heading to the water. Theory starting with proper understanding of all Full Cave standards and focusing on complex navigation planning and protocole for Jumps, Ts & Gaps together with complex circuits, gas recalculation strategies, pre-dive planning using cave maps & stick maps, use of referencing for recalculation and gas management for multi-stage purpose. 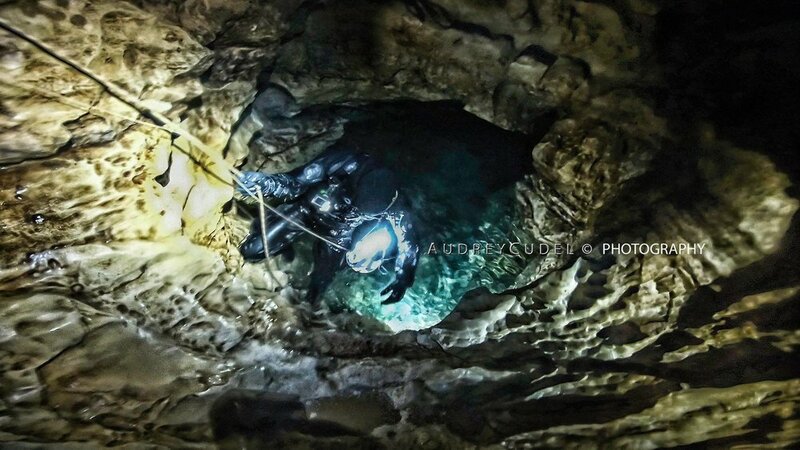 In water skills with repetition of all Intro to Cave skills, introduction to Jumps, Ts & Gaps procedures, referencing & gas recalculation on complex circuits, interaction with other Team’s circuit & markings, introduction to Cave Survey and permanent line deployment strategies. 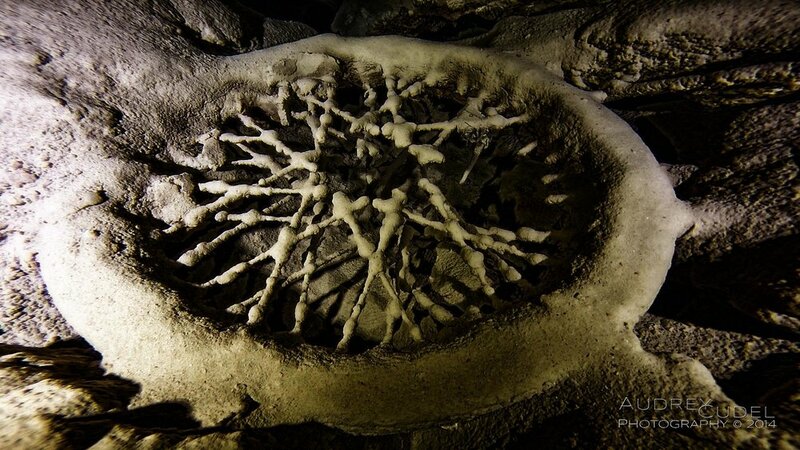 Cavern & Cave courses manuals/on-line training are complemented with a database of documentation of interest dealing with Accident Analysis, various cave organisations procedures, navigation protocols, ... which remain for your private use. 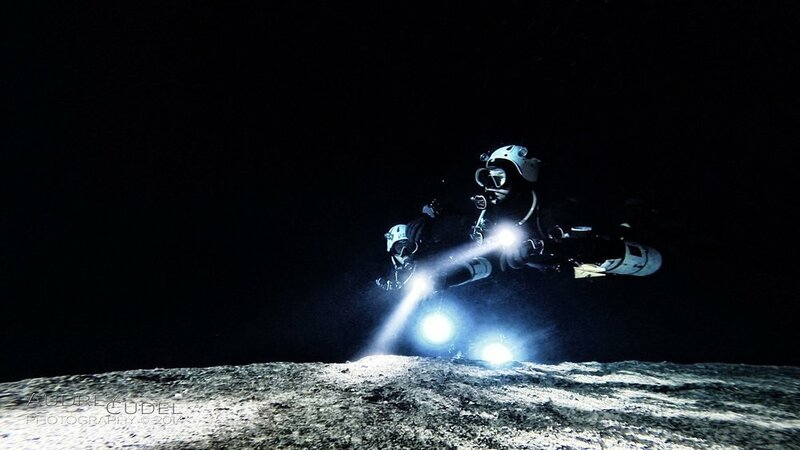 For most of us, the draw to Cave Diving is the sense of Exploration : the privilege to go where very few will ever go or become the first human being to go where no-one has ever been. 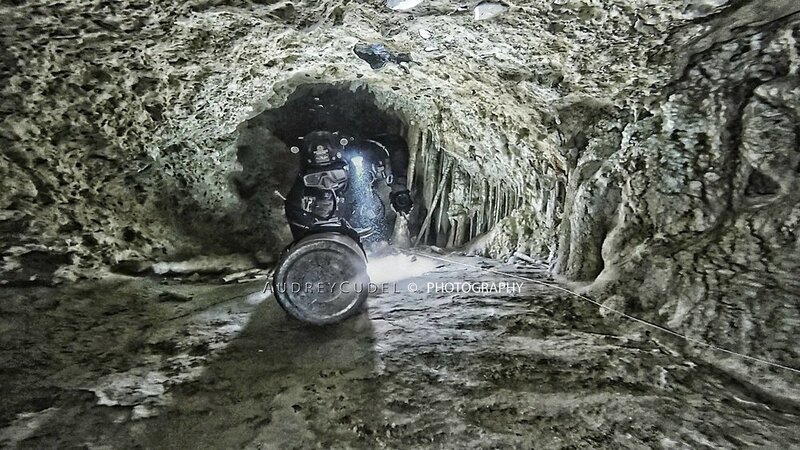 In our time, Cave Diving is potentially the last field left where a human being can be an explorer. As much as you follow an existing permanent line - which means someone has been there before - it does not diminish the thrill of diving into the unknown nor the pioneer spirit of your self-exploration for you have to learn self reliance and practice self-mastery. The main questions to ask yourself are always : is it worth it ? what is your true motivation ? One can hardly explain nor describe the feeling to time travel back to the origins of nature, the ever changing geology and amazing beauty of this hidden world and the diversity of caves and passages like nature naves leading from stunning colours to another variety of structures. 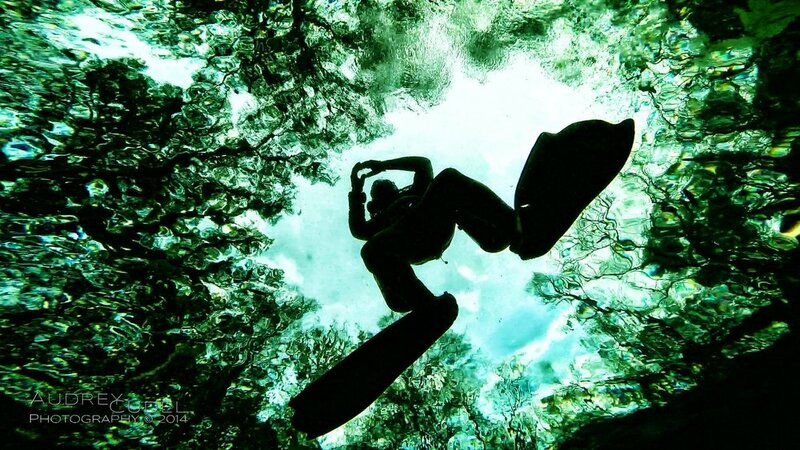 Cave diving is considered as one of the most challenging and potentially dangerous kinds of sports. It presents many hazards : depth, flow, visibility, ... and despite enhanced training and equipment, it still causes fatalities. So what is down there that is worth it? Understanding the environment you intend to enter and its elements is important but is not enough. You have to identify your own limits, be confident in your own abilities based on your level of experience and maintain above all, your power of judgment. In the most threatening situations, what could mean the difference between life and death is your ability to remain in control and calm enough to master even the most basic bodily reaction. Your first way out is always not letting panic and adrenaline take over which might be fatal. Like in any Technical Diving activity, you first have to come up with a plan and as much information available to nourish it and make it sensible. Don’t get tempted to go this extra step that will jeopardise everything. You’re a pilot driving your own 747, go through your equipment review and all the check lists involved, never make an exception to any protocol involved for they allow you to develop safe motor skills and reflexes when your mind might have to deal with more. Never trust your buddies beyond your own capability for they can never be your back up plan. Respect the environment you are privileged to explore and it will respect you back. Keep in mind that there is no place worth exploring without proper survey skills so keep it at your inner exploration level for now. Any dark thought, any equipment failure, any argument or question mark has nothing to do inside a Cave, better off dealing with it outside. 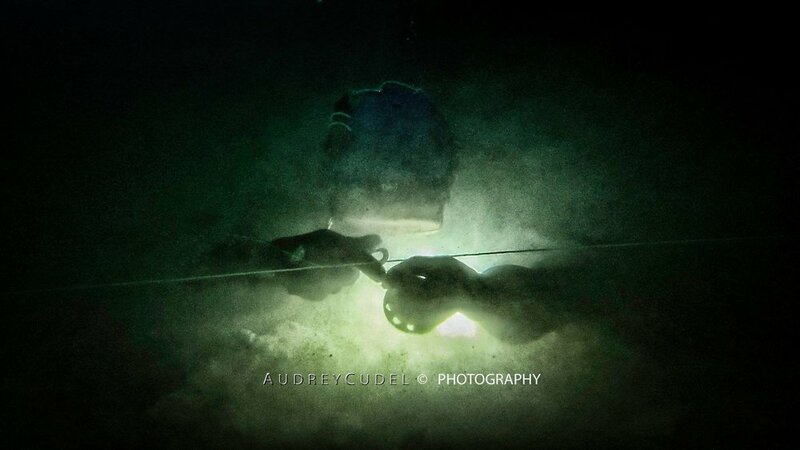 There is more pride in calling a dive than not acknowledging your own limits, that’s where true exploration starts. A number of cave diving rules, out of five general contributing factors for safe cave diving became generally accepted from Sheck Exley’s publication in 1979 about Accident Analysis ‘Basic Cave Diving: A Blueprint for Survival’ : Training, Guideline, Depth, Breathing Gas & Light. 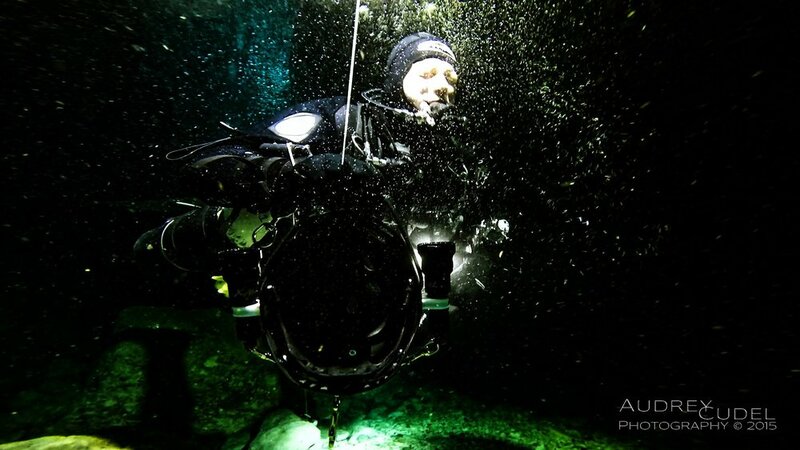 Training : Each stage of training is intended to be reinforced with actual cave diving in the real world to develop competence before starting training at a more complex level. Guideline : you are the only judge when it comes to validating the routing, safeness and appropriate tension on a line you might have to use as a support for your way out with or without visibility. You are the only one responsible for not being able to follow a continuous guideline back to the exit. 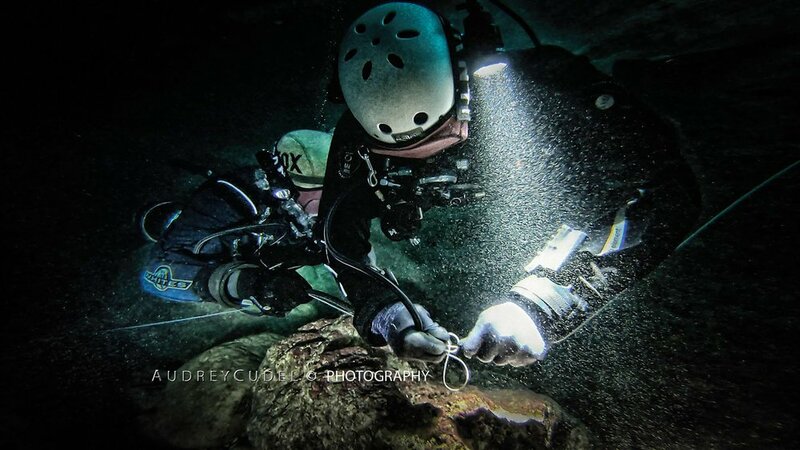 Depth rules : Gas consumption and decompression involved with depth together with the effects of narcosis are critical in a cave due to the high task loading and presence of combinations of hazards. 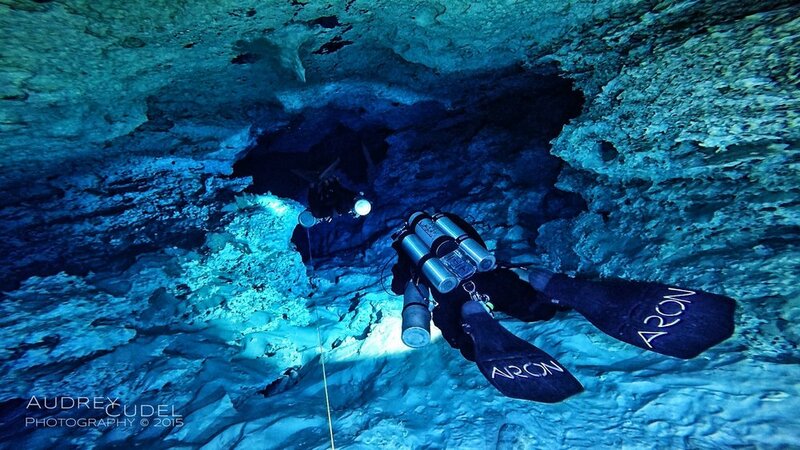 A cave profile is more constraining than an open water environment where one could make a controlled ascent and requires appropriate gas choices and dive planning upfront. 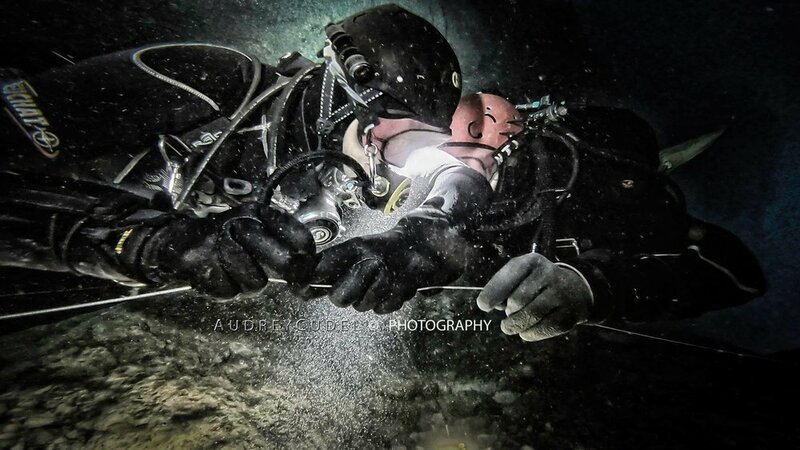 Breathing gas management : the rule of thirds is NOT extensive for all cave dives. Rule of fourths or minimum gas might add a safer reserve when it comes to increased gas consumption that a loss of air or visibility may induce. Inflow currents also involve safer gas planning. 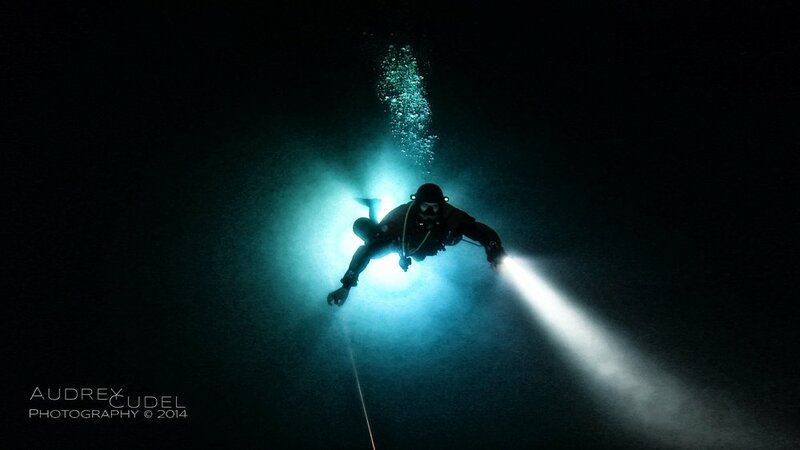 Lights : a minimum of three independent fully charged lights are needed for primary light failure or lost diver protocols . Their burn time shall be included as part of the dive planning.